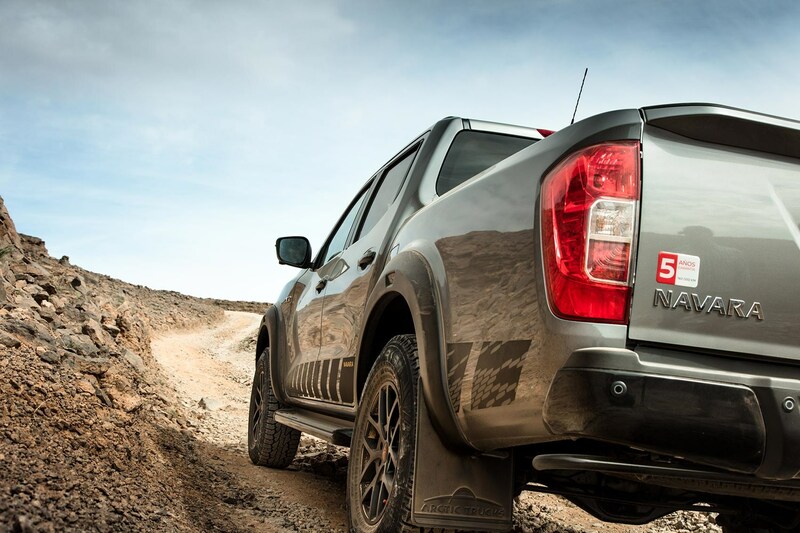 Nissan reckons its new Navara is the most capable off-roader in its current European portfolio. Which explains why I’m gunning this new special edition up a towering 200 metre-high Trump-orange dune near Er-Rachidia in Morocco’s eastern Drâa-Tafilalet region, on a gruelling route to Ouarzazate that once played host to the Paris-Dakar Rally. Based on the EnGuard concept shown at the Hanover motor show two years ago, this N-Guard is also fitted with Nissan’s catchily-entitled Off-Roader AT32 off-road factory pack which adds a 20mm hike in ride-height, full steel underbody protection and flared wheelarches filled with 17-inch alloys shod with 275/70 R Nokian Rotivva RT tyres. There’s even the further option of a front-locking differential for extra traction, and a snorkel for wading fans. Handy in the Sahara. The 1975kg N-Guard rockets up the talcum-powder dune with sand-spraying ease. Unsurprising, given its big capacity 187bhp 2298cc bi-turbo diesel knocks on the door with 332lb ft of torque at just 1500rpm, both front and rear differentials are divvying up all that twist action to the wheels with the most grip, the all-wheel drive system is in go-anywhere low-ratio mode and the seven-speed automatic transmission is deftly juggling first, second and third gears with smooth and unruffled precision. I see blue sky filling the windscreen as we reach the summit, come off the throttle and let the Nissan roll to a stop on the crest of the dune. For as far as the eye can see there are picture-perfect dunes stretching away to the horizon in every direction. And as if on cue, a train of American tourist-toting camels appears over a ridge and crosses in front of us, to create the perfect desert cliché. We sit in the thick silence watching these oddly uncomfortable creatures, and their steeds, roll out of sight before firing up the Navara and heading for the next set of dunes. Nissan’s third-generation Navara has quickly established itself as a pick-up sales star. Launched in very early 2016, the NP300 garnered an immediate reputation as the right product at the right time. So much so that in its debut year, this lumber-lugging one-tonner scooped the coveted International Pick-Up of the Year award. The UK and Europe has taken a shine to this tough, intelligently engineered and handsome workhorse, enjoying its winning character that combined go-anywhere versatility with top-end safety, convenience and luxury features. How much of a shine, you ask? Well, in 2018 Europe is expected to hoover up 185,000 one-tonne pick-ups, and since January the Barcelona-built Navara has generated European sales of 21,200. Total annual UK pick-up sales for 2018 are expected to hit the 53,500 mark, with the Navara racking up 8000 sales to date – enough to push it into third place behind the Mitsubishi L200 and the best-selling Ford Ranger. Nine out of 10 Navara buyers opt for the five-seater double-cab configuration like we're testing here. Okay, that’s small beer compared to sales of comparably-priced Qashqais, but indicative of a lucrative growing sector of buyers looking for one car that can handle both a tough working week and the weekend family duties that follow, all in one four-wheeled high-riding stride. The Navara is Nissan’s best-selling LCV and with the N-Guard expected to account for 70% of sales going forward, it will play a key role in Nissan’s optimistic plans to boost global LCV sales by 40% come 2022, particularly given the fallout after the recent arrest of Carlos Ghosn, chairman of Renault Nissan for alleged financial misconduct. But don't underestimate the Nissan-Renault-Mitsubishi alliance - in a global LCV market of 16.5m global annual sales, the group has massive leverage in this sector, with those three brands complemented by tie-ins with Mercedes-Benz and Dong Feng. With 152 countries buying Nissan’s LCVs, every sixth LCV sold in the world wears a Nissan badge. The new N-Guard model looks set to enhance the Navara’s appeal by following the tried and rusted recipe of combining a healthy dash of additional equipment, and a tasty set of visual upgrades, all topped off by an relatively appetising value-for-money price tag. While other Navara models come with the option of a lower powered 158bhp version of Nissan’s 2298cc biturbo diesel engine, the N-Guard is only available with the beefier 187bhp version. The standard fit six-speed manual weighs in at £32,780 ex VAT – a chunky £5455 more than the equivalent Tekna. However, its long throw and agricultural quality means frankly, it’s best avoided. It’s the £34,196 ex VAT seven-speed auto that’s the one to go for. Based on the top-dog Tekna model, the N-Guard’s front grille, fog lamp surrounds, mirror covers, door handles and rear bumper are all finished in glossy black, as are the roof-rails and 18-inch alloys. Black-backed LED headlamps and a powered sunroof are also thrown in, along with some slightly dubious sill decals. Inside, the cabin gets the similar funereal treatment with new grippier seats covered in dark grey leather with yellow sticking. It looks better than it sounds, in a Darth Vader goes to B&Q kind of way. The list of goodies runs long, but key features include: dual zone climate control, heated front seats, cruise control, 360°Intelligent Around View Monitor camera, rear paring camera, electronic rear eDiff and a 7inch touchscreen for satnav and infotainment. Safety systems are equally abundant: seven airbags, Forward Emergency Braking, Vehicle Dynamic Control, Hill Descent Control, and ABS with EBD and Brake Assist are all standard. The AT32 upgrade is a pan-European offering, and although only a 5% uptake is expected among N-Guard buyers in the UK, its halo model positioning and messaging is clear – this is bonefide go-where-do-anything pick-up. What’s the N-Guard like off-road when it’s not tackling dunes? Impressive in a word. This region of Morocco experienced more rain in the week running up to our arrival than it has done in the last 20 years, peppering the red, khaki and taupe Martian landscapes with bright lime-green swathes of the most patient and hardy grasses and succulents. 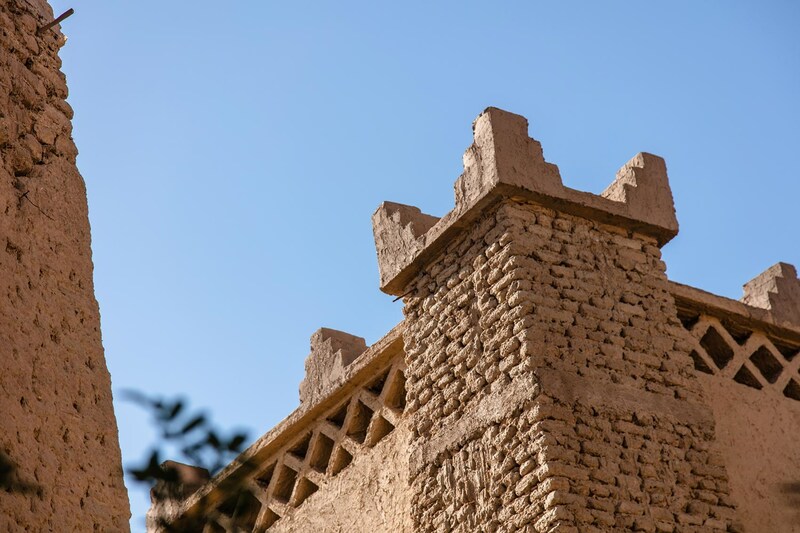 Which is all very pretty, but it also means that much of our route down to the dunes in Erg Chebbi are layered in thick glutinous red mud, and rivers – well, fast-moving puddles – have veined their way across much of our routes. That optional snorkel won't be necessary, but by any off-road standards, it’s tough going. The Navara slews and slides its way through the jelly-like glutinous gloop with nonchalant ease. You just, in the words of one of our guides, need to be ‘happy with the gas!’ pretty much all the time to maintain forward momentum through the gluey slop. In high-ratio all-paw drive the Nissan positively flies across the cratered stone-strewn plains between El Jorf and Sigilmasa. Here the rain has already dried up leaving a lunar landscape coated in a layer of choking dust that our convoy send high up into the air to mark our passing. 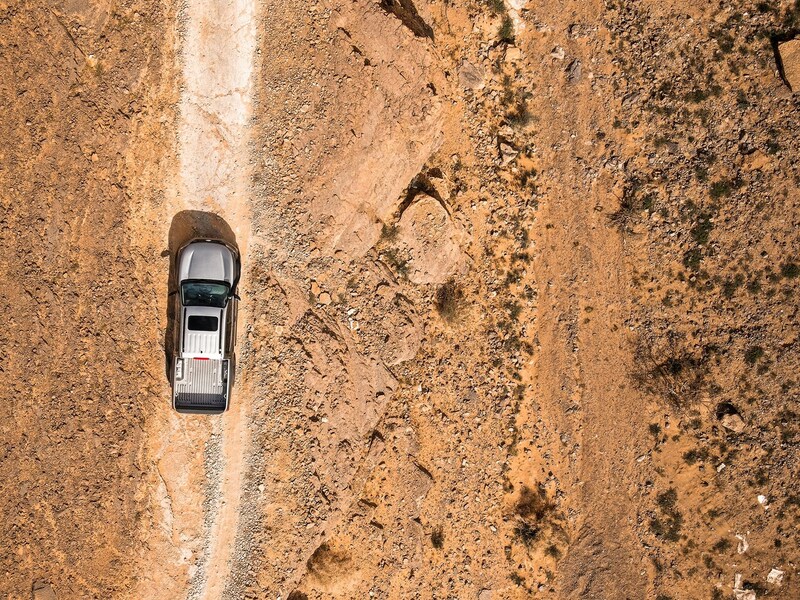 The rattle and roar of stone and sand being kicked up against the wheelarches and underside of the Navara drowns out the background rumble of the twin-turbo diesel, and the generously appointed cabin feels solid and squeak-free. Driving through this harsh and geologically-defined arid world and meeting the people that call it home certainly provides a sense of perspective. Inland from the coastal holidaymaker havens, there’s no thickly applied veneer of tourism gloss. Poverty is rife and the numerous small villages and hamlets we drive through look like all-too realistic sets for big-budget apocalyptic movies. There’s a heavy police presence with multiple speed checks on the entry and exit to the larger towns, although this smacks more of backhand revenue-raising than actually dealing with the safety and road-worthiness of the ancient W123 Mercedes-Benz and clapped out Renault 4s, 5s and 9s that jostle with all manner of illegal-looking forms of transport that involve odd number of wheels, donkeys and zero safety features. 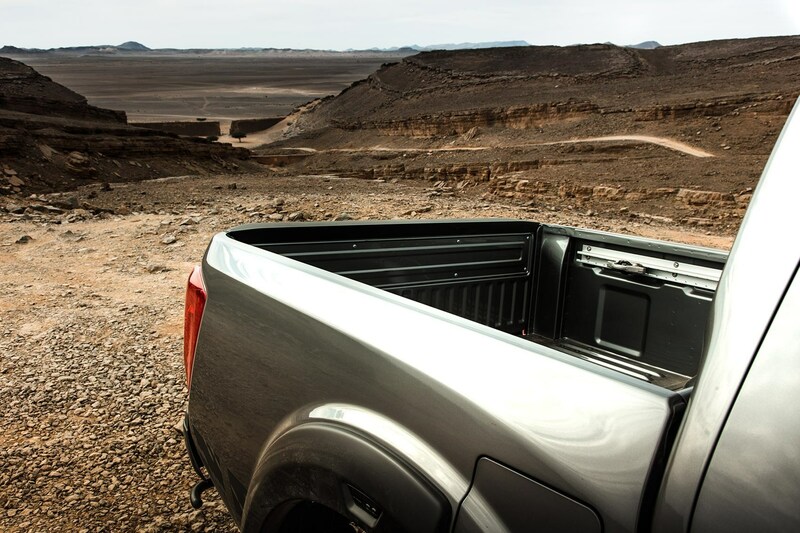 So the Navara is accomplished off the beaten track, but what’s it like when you turn back onto the tarmac? 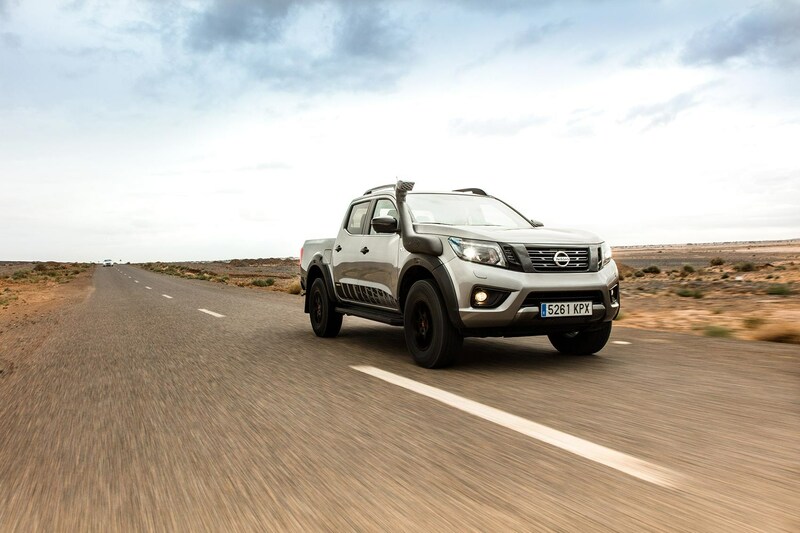 Key to the Navara’s success was Nissan’s decision to fit the best-selling doublecab variant with a five-link rear suspension layout, rather than the live rear axle fitted to the workaday base model. This means the Navara rides and handles in a far more car-like manner. It’s not going to match the sophistication of European SUVs, but the Nissan makes a very decent fist indeed of delivering decent dynamics. And it’s obvious by the punishing off-road regime we’ve just put the Nissan through that this rear suspension layout hasn’t in any way affected its ability to get down and dirty. Overall refinement levels are fine, the gearbox does a good job of slipping unobtrusively through its ratios to making best use of all that low-rev torque and avoid pushing the engine above 3000rpm where it starts getting a little raucous. In short, it’s a perfectly adequate compromise between on and off-road work. Job done then. Anything else to report before riding off into the sunset? And according to Francesco Giacalone, Nissan Europe’s director of product planning and marketing, don’t expect the styling of the recent Navara Dark Sky concept – you know, the zany one with the telescope – to play a role when the Navara is facelifted. “It’s unlikely we’ll see the Dark Sky styling make it’s way onto the Navara. It’s more likely that when it comes time to refresh the Navara in around 2021, that investment with be spent on engine and safety technology – that falls in line with our Intelligent Mobility ethos, and it’s what our customers want. What about these other enormous off-roaders? Nissan also brought along three of its other global off-road vehicles – the Patrol, Terra and Titan – for us to go kicking up dust. None will be sold in the UK, but it’s an interesting cultural exercise to see what passes for a ‘truck’ in America, the Middle East, and South East Asia. First up, the Patrol. This is the daddy of Nissan’s off-roader line-up. Tried and tested to death in the desert to ensure it can handle the rigours of driving in the Emirates, it’s a 5.6-litre V8-powered 2585kg go-anywhere leather and faux-wood seven-seater land yacht. It looks and feels indestructible, and over every part of our two-day desert rally raid, it never felt anything other than unflappable. Quite literally a calm and refined mobile desert oasis. 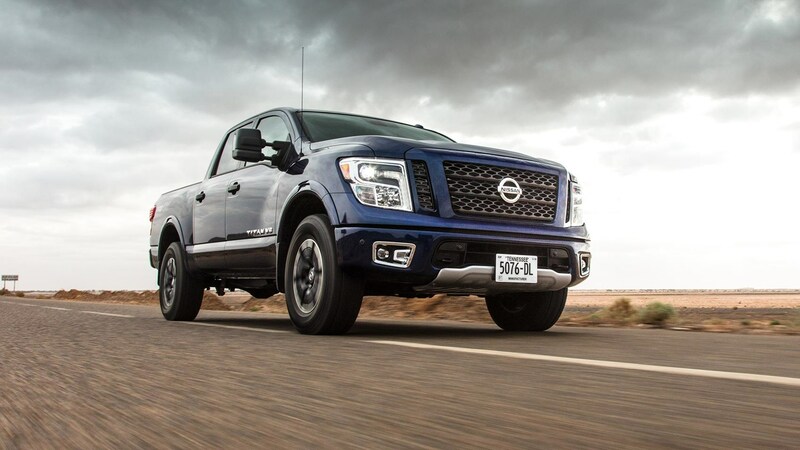 The Titan (below) – say Neeesahn Tydin in your best Stateside drawl for the correct pronunciation – is a vast and tough good ole boy truck that’s enormous in both dimension and character. Think angry bare-knuckle fighter one ill-judged barroom taunt away from breaking bones. This Pro4X off-road version is, despite it’s Far Eastern badge, designed, developed and built in America. It has a 5.6-litre nat-asp V8 petrol engine, seven-speed autobox, a 5.7-tonne towing capacity and 16 cupholders. Yes, 16. With the choice of 2wd, 4wd, different bed-lengths and five trim levels, there are 400 variations to chose from. Impressive, until you remember Ford offers a scarcely believable 1,000,000 permutations of its best-selling F150. Awesome in Alabama, probably just that little too large for Leicestershire. Newly launched for the vast and hungry South-East Asian and Chinese markets, the Terra is effectively a seven-seater Navara that been engineered to handle those markets’ rough and demanding roads. It’s proving particularly popular in Thailand, where pick-up based SUVs benefit from attractive tax incentives. It feels competent and tough, but its swathes of hard and shiny plastics, ho-hum fit and finish and poor NVH show that it’s been built to a very specific budget. Named after the emotion Nissan UK sales staff would feel if they were told they had to shift a couple of thousand units a year.